We are now taking entries for our New GSD contest! Submit a great picture of your own German Shepherd Dog or puppy to enter our "GSD of the Month" Contest. One photo entry per person per month please. 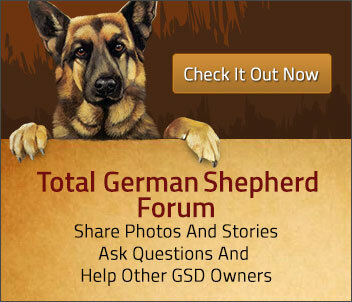 Our contest is open to all German Shepherds (dog and puppies) and GSD owners. Every month, one winner will be chosen as the new German Shepherd Dog of the Month from all entries, by a Guest Judge, chosen by the staff of Total-German-Shepherd.com. Because we so love to look at pictures of German Shepherds, we decided to give all our German Shepherd visitors and their owners the chance to strut their stuff on our site! Now you can show off those gorgeous dogs and puppies and win a fabulous dog prize too in the Total-German-Shepherd.com GSD Contest as well! Winner will be determined by the Guest Judge. The winners will be listed each month on our homepage, as well as being prominently posted on our German Shepherd GSD-of-the-Month page. 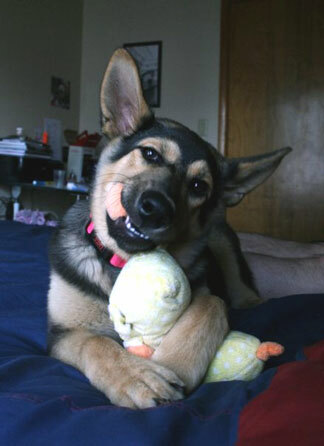 2) Submit the picture of your dog to us below (ATTN: GSD Contest entry) and tell us a little (or a whole lot please!) about him or her to put on the page as well. Your German Shepherd could be chosen as the latest and greatest GSD-of-the-Month to be featured on our site! No enhanced photos with additional text or graphics please. Limit of one photo, per dog, per month will be posted on the websites home page. Picture should be no larger than 600 x 600. 3) At the end of each year we have a GSD of the year chosen from the 11 monthly winners throughout the year. The GSD of the year winner receives a Varsity Ball valued at $40. To Go In The Draw To Win You Need To Enter Your Email Address On The Page You Go To After You Click "Submit Your Contribution" So We Can Get In Contact With You If You Win. Want to go in the running for GSD of the month? Ben is a 3.5 year old, 100 lb, high energy GSD who loves to play in the snow and help shovel snow. Magnum is a red sable long coat German Shepherd. He is 4 years old. He could play ball all day and loved the snow. We adore him!! Rocky at the pier. He is 7 months old. Here is 1 Year old Koda!! Always up for an adventure!! Gunnar is 5 months old. He's sweet, clumsy, and adorable. He loves to play with his tennis ball and is super smart! Just when you thought he would never lay down for a break. Our 14 month old gsd Blitz is awesome! This is our black beauty Giselle! She is so fun and silly... PHOTO CAPTION: Home Alarm System...ACTIVATED!!!! Molly will be 6yrs old in May 2016. She is spoiled rotten an loves car ride! This pictures tells it all! She loves being on the field for her Course Ability Test (CAT). This is Jarvis, our two year old German Shepherd living life in sunny Arizona. He wears your grandpas clothes and he looks incredible! 1. Each month Total-German-Shepherd.com will pick one (1) winner for our website. The winner's photograph will be prominently posted on both the home page and the GSD of the Month page of our website for one (1) month and then will be put in our Photo Gallery. 2. Please review the official GSD contest rules. After you have forwarded that special photograph, please start scanning our website for your pet's picture. All entries will be reviewed and the winner announced on our website, which will be updated approximately every thirty days. 3. Winners will not be notified by e-mail. Judges decisions are final. 4. This GSD Contest is open to all German Shepherds. 5. Total-German-Shepherd.com does not condone harm to any animals by causing the animal to pose in or be treated in an unsafe or uncomfortable manner in order to capture a photo. 1. All photos must be submitted in .gif or .jpg format. 2. By your submission, you hereby certify that, you are 21 years or more of age. 3. On behalf of yourself and the pet(s) in the photograph(s) submitted in this contest by you, you hereby, without further compensation, grant Total-German-Shepherd.com, the right to use your photograph(s) or likeness(es), edited or unedited for any purpose it may desire. You certify that you are the exclusive owner of all right, title, and interest in your pet, your pet's image and likeness, the photograph or video and any goodwill associated therewith. You hereby agree that there shall be no liability to Total-German-Shepherd.com by virtue of any distortion, alteration, optical illusion, or use in composite form that may occur to be produced in the development or transposition of the published photographs or in the published photographs themselves. 4. Winning photographs for the website will be selected every month. Judging will take place on a monthly basis. Judges decisions are final.